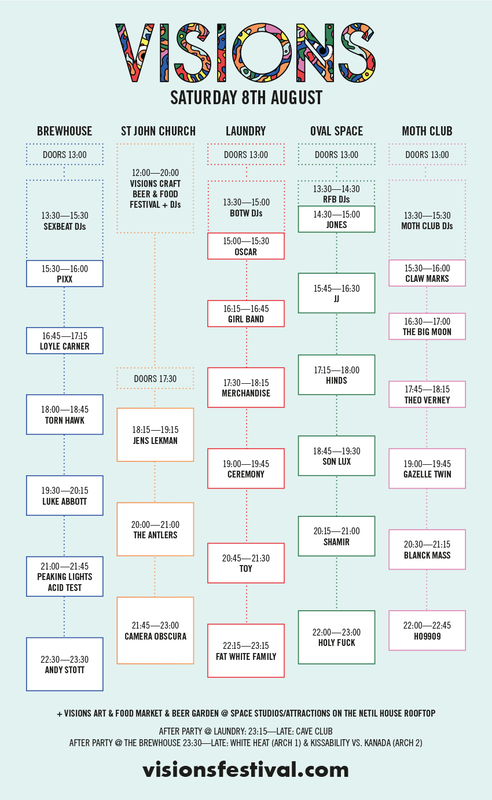 With one week to go, the running order and stage times for Visions Festival 2015 has been revealed. With only one week to go until the event, VISIONS festival reveals all stage running orders and times. The event takes place on Saturday 8th August across different warehouse venues, art spaces, courtyards, rooftops, churches and outdoor areas in London Fields. There are also some exciting additions across VISIONS market. As well as the art market, record fare and screen print class at our new outdoor courtyard Space Studios we are pleased to announce the addition of food stalls including Tiberi London and The Athenian as well as Estrella Galicia beer cocktails and the all new VISIONS frozen margarita bar. Completing the food and beer festivities, One Mile End Brewery and Home Brew Depot will be performing a very special collaboration and brewing a one off VISIONS beer LIVE. Head down to the craft beer and food festival at St John’s from 12pm to watch the brew in session and learn how to reproduce yourself. Moth Club is today also revealed as a venue being used as part of VISIONS for special performances from the likes of Ho99o9, Blanck Mass, Gazelle Twin, Big Moon and more. An ex servicemen's members' club in the heart of Hackney, revitalised and reopened for the whole of the borough. VISIONS festival will be an opportunity for people to see it first as a special sneak preview before the venue's official launch in September. The venue will also host a special pre-party headlined by Ceremony with support from Bad Breeding, Chain of Flowers and VISIONS DJs. Finally, VISIONS announces special after-parties for those with a festival ticket. Cave Club will host a party at The Laundry and White Heat, Kanada and Kissability will take over the two arches at London Fields venues.